NOT MADE ANYMORE AND HARD TO FIND. 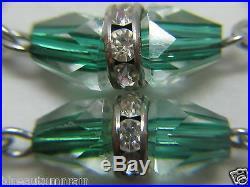 UNUSUAL SPARKLY CUBED OR SQUARED SHAPED FACETED CLEAR CRYSTAL MATER BEADS & 2 CONED SHAPED GREEN MURANO BEADS CIRCLED IN THE MIDDLE OF PATERS CLEAR RHINESTONES. SOLID STERLING SILVER ELEMENTS THROUGHOUT ETCHED LINKS BEADED CATHOLIC ROSARY 28 3/4" (LENGTH) 38" (ROUND NECK) WEIGHS 59.76 O-1. AS OF NOW PEOPLE HAVE ASKED ME ABOUT "BLESSING" OR "BLESSED ITEMS". PRAYERS WOULD BE SAID UPON REQUEST OF PEOPLE AS WELL. I OFTEN SEND THE NUNS A LIST OF PEOPLE TO PRAY FOR. SO, LET ME KNOW IF YOU WOULD LIKE THIS DONE. THERE ARE NO LONGER MADE AND ARE HARDER AND HARDER TO FIND. THIS GORGEOUS AND STUNNING ENORMOUS VINTAGE STERLING SILVER ROSARY IS VERY SPECIAL! 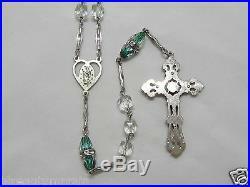 ONE THE NICEST HEIRLOOM ROSARIES I HAVE SEEN AND VERY SOUGHT AFTER! THIS ROSARY IS PART OF AN ESTATE FIND! THE ROSARY FEELS VERY PEACEFUL IN YOUR HAND! 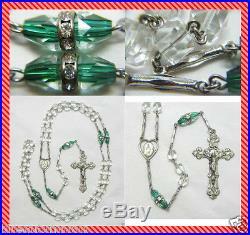 WONDERFUL FIND FOR ANYONE WHO COLLECTS ROSARIES. ALSO A BEAUTIFUL DEVOTIONAL PIECE TO PRAY UPON! 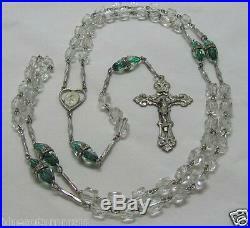 THE ANTIQUE SWAOVSKI LOOKING CRYSTALS & STERLING UNIQUE ROSARY MEASURES 28 3/4" IN LENGTH AND AROUND NECK 38". 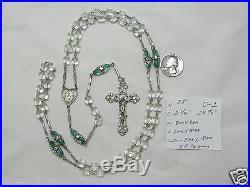 THIS IS A VERY NICE SIZE VINTAGE STERLING ROSARY AND WOULD BE WONDERFUL FOR A COLLECTOR! THE MATER VERY UNIQUE CUBED BEADS ARE GORGEOUS AND UNLIKE ANY YOU WILL SEE. 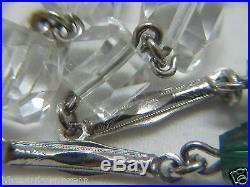 THESE BEADS ARE MADE UP OF FACETED CLEAR CRYSTAL MATER BEADS THAT MEASURE 8MM BY 7MM. THE PATER BEADS THE MIDDLE IS SURROUNDED WITH GENUINE. CRYSTALS ENCASED WITHIN THE BEAD IN THE MIDDLE OF TWO CONED SHAPED MURANO BEADS THAT FADE FROM GREEEN CENTER TO CLEAR OUTTER. THIS ADDS A SPARKLE THAT IS UNBELIEVABLE! THEY MEASURE 11MM BY 10MM ROUND. THIS IS HARD TO PART WITH BUT I KNOW THERE ARE MANY PEOPLE OUT THERE THAT WOULD LOVE TO HAVE THAT SOMETHING SPECIAL. 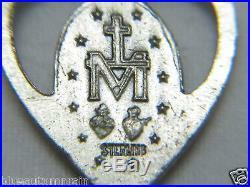 THE LINKS ARE STERLING AND ETCHED AND MEASURE 18MM BY 3MM. 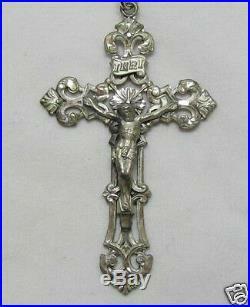 THE UNUSUAL AND HUGE CRUCIFIX MEASURES 2 5/16 IN LENGTH AND IS VERY BEAUTIFUL AND LOOKS ALMOST LIKE LACE. BUT DON'T LET THAT FOOL YOU, IT IS VERY HEAVY AND AGAIN FEELS SO NICE AS YOU PRAY! 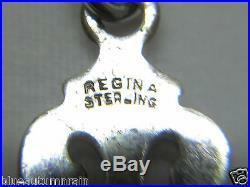 THE SIDE OF THE CRUCIFIX IS MARKED "STERLING" & "REGINA". THE CRUCIFIX IS VERY BEAUTIFUL AND FEELS NICE IN YOUR HANDS. THE DETAILS ON THIS ROSARY AND ESPECIALLY THE CRUCIFIX IS SO GORGEOUS. 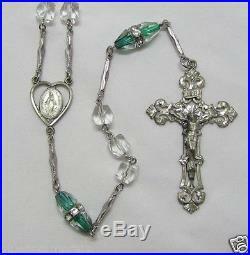 THEY DON'T MAKE ROSARIES LIKE THESE ANYMORE! PLEASE SEE THE PICTURES FOR MORE DETAIL. THE CENTERPIECE IS VERY BEAUTIFUL WITH THE BLESSED MOTHER MARY ON THE FRONT AND THE SACRED HEART ON THE BACK! THE CENTERPIECE IS ABSOLUTELY BEAUTIFUL AND AGAIN FEELS WONDERFUL TO THE TOUCH AS YOU PRAY UPON IT. THE BACK OF THE CENTERPIECE IS MARKED "STERLING". PLEASE SEE THE PICTURES FOR GREATER DETAIL OF THE MISS STAMP PERFECT FOR ANY TIME AND A LOVELY REMINDER OF THE SACRIFICE JESUS MADE. GREAT FOR BOTH YOUNG AND OLD AND MALE AND FEMALE. ALL OF THE 59 BEADS ARE PRESENT AND IN GREAT CONDITION. 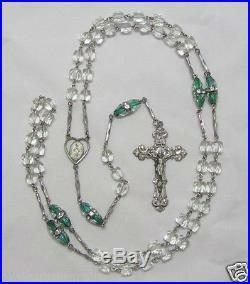 OVERALL THIS ROSARY IS IN WONDERFUL CONDITION FOR IT'S AGE. I LEAVE THAT UP TO THE NEW OWNER. THANK YOU FOR STOPPING BY MY AUCTIONS TODAY! I have done my best to describe the item to the best of my ability. But please check out all the pictures to see the item as it is. ALL the items come from a "SMOKE-FREE HOME". I will be glad to take the time to answer any of your questions. Blueautumnrain Thoughts of Preparing yourself for Lent Season.... Easter / Lent is a very important personal Journey each year in my own personal life. It is almost like my own personal "renewal" and or " rebirth" of the imprint of my spirit. It does not mean I can swipe the slate clean and go without repentance of my own sins prior. I once thought about taking Holy Orders and is why I think I have attacked such wonderful Religious Possessions to me. I also think there are endless definitions of even the existence of God. How we get to our own inner spirit is as diverse are there are stars in the sky. But I have been asked about how and even why pray the Rosary. As I end my ramblings now I leave you with this something that I read this once and found it very much how the path feels for me and written is words I could not find myself and so I share. After that you will find the HOW TO PRAY THE ROSARY. As we pray and ponder the mystery of Jesus passion, death and resurrection let us ask God to create a new heart in our lives and societies, so that we may turn away from the ashes of destruction and begin to embrace more fully the new life given us by Christ. Jesus is our model because Jesus throughout manifests full, complete and active adherence to the will of him who sent him. His passion glorifies the Father because it forcefully reveals the power of his love that saves the whole of human kind. Every journey begins with a single step. To take that step one must have the desire to make the journey. Every journey is a voyage of discovery. Sometimes the terrain traveled is familiar, sometimes the terrain is seen for the first time; whatever the case, the Sacred journey is a journey intended to enhance our relationship with God and meet the Risen Christ in a new way. Biblically, the first person to undertake a personal journey of faith and discovery is Abraham and his wife Sarah. Now the Lord said to Abram (Abraham)'Go from your country and your kindred and your father's house to the land that I will show you. (Genesis 12:1) Two things are implied in this invitation: A journey into the unknown based on trust and faith and a personal journey of discovery of this God who offers the invitation and promise of blessing. In spirituality the desert or wilderness is symbolic of the struggle to obey, heed, and listen to the voice of God who calls and issues the invitation. It is often tortuous, twisting, challenging involving purging, purifying, cleansing so that one's personal self can experience transformation through the process of dying to the old self and rising to new life, a life of total trust and intimacy with the One Who Calls. A we touch upon key moments in the life of Jesus' journey we will try to make applications to our own journey of faith. HOW TO PRAY THE ROSARY Prayers of the Rosary Prayer Before The Rosary Queen of the Holy Rosary, you have designed to come to Fatima and Medjugorje, to reveal to the three shepherd children and six visionaries, the treasures of grace hidden in the Rosary. Inspire my heart with a sincere love of this devotion, in order that by meditating on the Mysteries of our Redemption which are recalled in it, I may obtain peace for the world, the conversion of sinners, and the favor which I ask of you in this Rosary (Mention your request). I ask it for the greater glory of God, for your own honor, and for the good of souls, especially for my own. The Our Father: Our Father who art in heaven, hallowed be Thy name; Thy kingdom come; Thy will be done on earth as it is in Heaven. Give us this day our daily bread; and forgive us our trespasses as we forgive those who trespass against us; and lead us not into temptation, but deliver us from evil. The Hail Mary: Hail Mary, full of grace! The Lord is with thee; blessed are thou among women, and blessed is the fruit of thy womb, Jesus. Holy Mary, Mother of God, pray for us sinners now and at the hour of our death. Glory be to the Father: Glory be to the Father, and to the Son, and to the Holy Spirit. As it was in the beginning, is now, and ever shall be, world without end. Prayer to Jesus Requested By Our Lady O My Jesus, forgive us our sins, save us from the fires of hell, take all souls to Heaven, and help especially those most in need of Your mercy. The Apostles' Creed: I believe in God, the Father Almighty, Creator of Heaven and earth; and in Jesus Christ His only Son, Our Lord; who was conceived by the Holy Spirit, born of the Virgin Mary, suffered under Pontius Pilate, was crucified, died and was buried. He descended into Hell; the third day He arose again from the dead; He ascended into Heaven, and is seated at the right hand of God, the Father Almighty; from thence He shall come to judge the living and the dead. I believe in the Holy Spirit, the Holy Catholic Church, the communion of Saints, the forgiveness of sins, the resurrection of the body, and life everlasting. Holy Queen, Mother of Mercy, our life, our sweetness and our hope. To you do we cry, poor banished children of Eve. To you do we send up our sighs, mourning and weeping in this valley of tears. Turn then, O most gracious advocate, your eyes of mercy towards us; and after this our exile, show unto us the blessed fruit of your womb, Jesus. Pray for us, O Holy Mother of God, that we may be made worthy of the promises of Christ. Rosary Novenas Religious devotion, public or private, for the duration of nine days to gain special graces, is called a Novena. Those who perform it with a lively hope of having their request granted, and with perfect faith and resignation if it be refused, may be assured that Christ will grant some grace or blessing. This requires an understanding that in His infinite wisdom and mercy, He may refuse the particular favor which is requested. Novenas originated in imitation of the Apostles who were gathered together in prayer for nine days from the time of Our Lord's Ascension (to Heaven) until Pentecost Sunday (the descent of the Holy Spirit). This practice of saying the Rosary nine times in the form of the Rosary Novena in petition or thanksgiving, is another way of heeding Our Lady's request to Pray the Rosary. The 54 Day Novena Devotion which originated in 1884 at the Sanctuary of Our Lady of the Rosary of Pompei, consists of the daily recitation of five decades of the Rosary (one complete Mystery: Joyful, Sorrowful, or Glorious) for twenty-seven days in petition and five decades for twenty-seven additional days in thanksgiving. You will actually be making three Novenas in petition for a particular favor and three Novenas in thanksgiving for a particular favor. 1st day say the 5 Joyful Mysteries 2nd day say the 5 Luminous Mysteries 3rd day say the 5 Sorrowful Mysteries 4th day say the 5 Glorious Mysteries 5th day begin again the 5 Joyful Mysteries, etc. The Family Rosary The Family That Prays Together... The family Rosary is the Rosary recited aloud together, by as many of the family and their friends as can be present. Any family (two or more people) may say the Family Rosary in any suitable place and at any time. A leader says aloud the first part of each prayer; a second person or group of persons answers aloud the second part of the prayer. To begin the Family Rosary, all hold the Crucifix of their Rosary in the right hand and make the Sign of the Cross. The leader begins the Apostles' Creed and proceeds through the rest of the Rosary as shown on Page 2. The leader announces the Mystery before each decade. Five decades (one complete Mystery: Joyful, Sorrowful, or Glorious) should be recited each day. The Five First Saturdays Mary's Great Promise at Fatima - The Five First Saturdays are intended to honor and to make reparation to the Immaculate Heart of Mary for all the blasphemes and ingratitude of men. This devotion and the wonderful promises connected with it were revealed by the Blessed Virgin at Fatima, a small village in Portugal. Our lady appeared to three children there in 1917, and one of the little girls, Lucy, tells us that Our Lady said: I promise to help at the hour of death, with the graces needed for salvation, whoever on the First Saturday of five consecutive months shall: 1. Recite five decades of the Rosary (Joyful, Luminous, Sorrowful, or Glorious Mysteries) 3. Keep me company for fifteen minutes while meditating on the fifteen Mysteries of the Rosary, with the intention of making reparation to me. All are Blessed and each are unique and special to me. Some of my Rosaries are from the later 1800s and Victorian and before the turn of the 1900 Century. Others are from the turn of the Century. Some are dated and others show the age from the design, style and or material they are made of. Materials they are made of are Sterling Silver, Brass, Silver Plated, Gun Metal, Rope and Plastic. The Beads of some of these Rosaries are made of Sterling Silver, Ebony, Mother of Pearl, Horn / Horned, Ox, Bone, Swarovski Crystal, Rock Crystal, and all sorts of different types of Glass. Czechoslovakian, Bohemian and much more. Some are Pectoral Rosaries and or owned by different Nuns and Priests, I have been so Blessed to have acquired over many years. At least one Estate is from an older Priest whom has passed away now about 15 years. These Rosaries from his Estate and are mostly from the 1920s through the 50s. The other is a Nun's Estate whom has passed now 20 years ago. These Rosaries are from the 1940s and even before. But I have been told and the evidence shows many of these items are even turn of the century. The Value of these Rosaries have never been monetary to me. ALL these Rosaries are blessed in some way or another with uniqueness. The Rosaries come from all sorts of places such as French, Czechoslovakia, Ireland (Erie) Germany, England, and many more countries. Some of the Rosaries are 5 decades and others are Franciscan and 7 decades. I also have some that are 20 Decades I will be putting up as well. Each has a story to tell in the devotion that was given them. And through each Rosary many prayers were said by these very devote and peaceful souls. The Rosaries are ALL precious to me and I must now part with them. Please know my only wish now is to find each and everyone of them a good and cherished home. They are very old and need care. I have not cleaned them for my own personal reasons. I believe each and every living thing or otherwise in life has an energy. These Rosaries are no exception to such a feeling of peaceful energy. Thus I have let them remain "as they were" when I received them. I have done my best to detail them in my pictures. I will answer any questions I can about them. I have just been a blessed one whom the Rosaries came to after the passing of their owners. Or contact me and I will look through all my Rosaries for the type of Rosary you might be looking for. Have a wonderful and beautiful day and may you always have LOVE in your life as I have found.. In the peace from above..... So I thought I would give a better understanding about myself. In doing so, I have also been blessed with items now I would wish to find loving home for. Most of the my things I have either given away or donated. Some have been lost because of circumstances. I have come to realize in my life I needed a new direction. I still have this need to "rescue" religious items mainly and give them a home that people will cherish as much as I have over the years. I still have people coming to me and offering me these treasures knowing that I would seek out a good home for them. Crazy I know, but this is really what it is for me. I do my best to describe the item and all it's flaws. I will do the same in return. As for the types of item I will be putting up... Truth is I live in the country in North Carolina now. And for fun my husband and I take long drives out to places most would never be able to get to. So I will pass these treasure I find too along to you as well. If you have any questions about me feel free to contact me. I would be blessed to share myself with you. As always find goodness in ALL that comes in your path. Life can and does often change on a dime. So please be gentle to yourself and those around you. May love find you always.... It is too late to work it out with me then. So please be kind and aware enough to not put me on a stop. There are no exceptions to this rule. CONTACT Please feel free to contact me about any item you have a question about. This will save any confusion later. If for any reason you are NOT 100% satisfied for any reason, please do not leave negative or neutral feedback. Thank you all again for all your words to me! It has been a pleasure to meet you all! May blessings come down upon you like soft "Autumnrain" Blueautumnrain Hello Buyers! Such as, Relics, Bibles, Books, Medals, Crosses, Holy Prayer Cards, Pins, Holy Water Bottles, Pocket Shrines and other Catholic items and Christian Books etc... I have had such joy collecting these items over the years, but now find the need to let them go to a Home that will cherish and love them as much as I have. Many of these have been blessed by previous Popes and were owned by either Priests and or Nuns. I have been honored to have held them in my possession all these years. But now find the need to let them go where they are destined to find homes where they can be cherished as much as I have them all. I will answer all questions in a timely fashion. I have just been fortunate to have been come across these beautiful and spiritual items. May the peace that passes all understandings be with you always. Sellers: Add a FREE map to your listings. The item "UNIQUE ANTIQUE STERLING GREEN MURANO With RHINESTONES & CUBED ROSARY NECKLACE" is in sale since Wednesday, October 28, 2015. 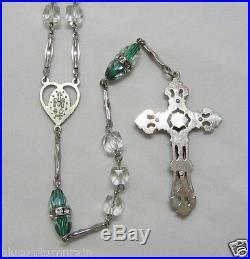 This item is in the category "Collectibles\Religion & Spirituality\Christianity\Rosaries". The seller is "blueautumnrain" and is located in USA. This item can be shipped to United States, Canada, United Kingdom, Denmark, Romania, Slovakia, Bulgaria, Czech republic, Finland, Hungary, Latvia, Lithuania, Malta, Estonia, Australia, Greece, Portugal, Cyprus, Slovenia, Japan, Sweden, South Korea, Indonesia, Taiwan, Thailand, Belgium, France, Hong Kong, Ireland, Netherlands, Poland, Spain, Italy, Germany, Austria, Israel, Mexico, New Zealand, Singapore, Switzerland, Norway, Saudi arabia, United arab emirates, Qatar, Kuwait, Bahrain, Croatia, Malaysia, Colombia, Bahamas, China, Uruguay, Bermuda, Bolivia, Egypt, Gibraltar, Guadeloupe, Jordan, Cayman islands, Sri lanka, Nicaragua, Pakistan, Paraguay.